Unless targeted at collectors who are happy to pay a premium for details and accuracy, toy versions of exotic sport cars rarely bear more than a passing resemblance to their real-life counterparts. So what happened here, because Playmobil’s Porsche 911 Carrera S is a near flawless replica. The Playmobil brand only dates back to 1974, but it has already managed to establish itself, particularly overseas, as one of the few toy lines that can give Lego a run for its money when it comes to the breadth, variety, and sheer number of sets available. Especially when it comes to cars. Just look at that smile. At $45, Playmobil’s Porsche is a bargain compared to similarly-sized die-cast replicas, but it’s clear the company’s designers still put a tremendous amount of work into ensuring the toy’s lines, curves, and other details are near perfect. The 911 Carrera S’s trunk does open, however, revealing the vehicle’s engine inside. And that license plate number? The PM is short for Playmobil, while the 3911 is the official model number for this set. Flip the Porsche over, remove an access panel, and you’ll find one of the best features of this toy. A small white box filled with three AAA batteries powering a set of colored LEDs that bring the Porsche’s lighting to life. The set also includes a replacement front bumper (the stock bumper easily snaps on and off) that adds a pair of more aggressive scoops. And it even comes with an extra set of hubcaps incorporating the red color scheme over the rest of the vehicle. It would have been nice, however, if Playmobil had included a helmet as an upgrade for the driver too, given he’ll most certainly be tempted to hoon his upgraded Carrera S as soon as he rolls out of the dealership. Hopefully there’s some airbags hidden away inside the toy. 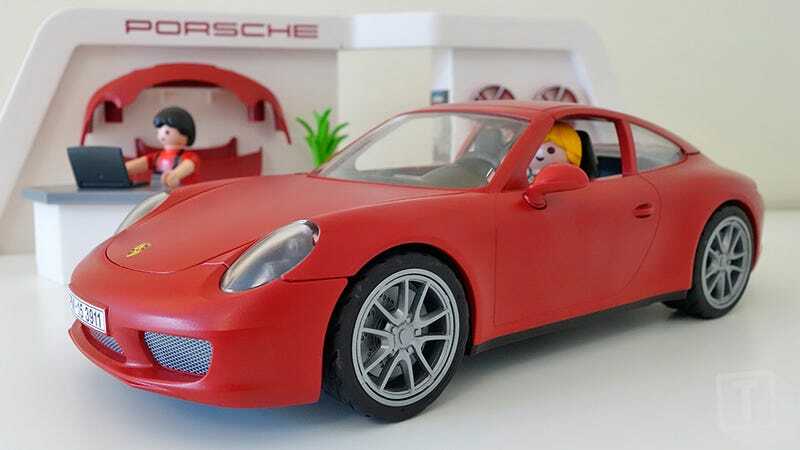 Those minor complaints aside, you have no reason to feel guilty about buying Playmobil’s Porsche 911 Carrera S for your kids now that it’s finally available in the US. Except for maybe actually handing it over to your kids once it arrives, instead of putting it on display on the corner of your desk, and taking it for a spin across all of your paper work every once in a while.